Interesting guest post by Mats Lewan Speaker, author and tech journalist, focusing on cutting edge technologies and their increasing impact on our lives. “When bits eats atoms [another nice metaphor for digitalization], scaling is everything,” said Henry Tirri. Tirri is the CTO of Harman International and former CTO at Nokia with a background as a Professor in Computer Science. On Tuesday, March 23, 2017, he participated in a panel at the annual meeting of Brussels-based EIT Digital—a part of the non-profit EIT which is an EU and industry-funded organization focusing on strengthening innovation and entrepreneurship in Europe. Tirri added that when you need to scale quickly in a digital world it’s an advantage to have a large and homogeneous home market. Which the US has. And China. While Europe doesn’t, being fragmented across cultures, nations, and languages. 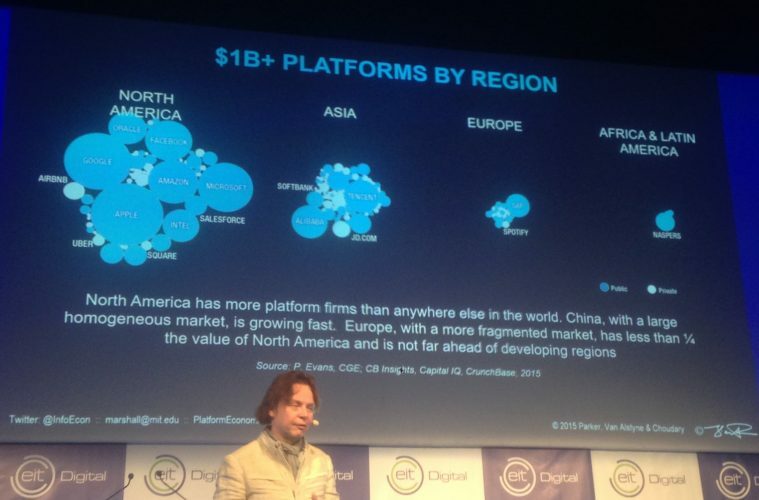 “Europe’s lack of platforms is a problem,” he also noted afterward in a keynote presentation. So far, platforms have proven to be the by far most competitive structure in a digital world—Facebook, Uber, Google, Apple IOS, Android, Airbnb, Baidu, Amazon… And what does Europe have? Only a few such as SAP and Spotify. In recent years it has turned out that young successful platforms tend to grow even quicker than many of the somewhat older ones. And again, this seems to happen with US and Chinese platforms, having the advantage of a large and homogeneous home market. Karen Boers, CEO of the European Startup Network, who participated in a panel with Tirri at the Brussels meeting, noted that you could see an advantage in the European multi-cultural situation when scaling beyond the home market to a fragmented global market. But even though there are exceptions, clearly it’s an advantage to have significant size before going global. It’s also worth noting that many brilliant European startups are being acquired by US platform corporations such as Apple and Google, through which their inventions can reach the entire world. Henry Tirri also highlighted another problem, exemplifying with the mobility industry which he expects to be hit by a ‘perfect storm’ with three converging technology fields—energy, connected vehicles and autonomous driving. Even though the European car industry is well positioned in this area, lacking an important digital platform means running the risk of being reduced to low margin OEMs, just like what happened in the PC and the mobile phone industry. EIT Digital, founded in 2009 as EIT ICT Labs, aims at addressing the European issue and help entrepreneurs collaborate with industry and universities, and going to market, all over Europe, while in this way also contributing to driving Europe’s digital transformation. The organization has nodes in Berlin, Budapest, Eindhoven, London, Madrid, Helsinki, Paris, Stockholm, and Trento, and also a hub in Silicon Valley. At the annual conference, EIT communicated that it in 2016 had seen nine new companies created, 75 products and services commercially launched, over 120 startups coached by the EIT Digital accelerator and €22 million in capital raised for accelerator-supported startups. In an expo area at the conference, some of these startups and companies presented themselves, among them Fibricheck, providing a smartphone connected heart monitoring tool, Inmotion VR, offering a VR-based gamified application for physiotherapist treatment, Fit2Perform, a connected and wearable technology for monitoring professional driver’s fitness and wellbeing, Coowry, a platform for using mobile phone airtime as a lowly regulated global micropayment system, Quantoz, building a blockchain based micropayment system for transactions by and between machines, PQP Tool, predicting product quality in mass manufacturing without quality checks through machine learning and sensor data, and Street Smart Retail, a cloud-based platform offering advanced consumer behavior analytics to shop owners without the need for data scientist competence. EIT Digital also arranges education focused on entrepreneurial skills in collaboration with universities and in 2016, more that 500 master school and 140 doctoral students were enrolled. Apart from on-campus courses, EIT runs an MOOC program (Massive Online Open Courses) where 20,000 students have participated. According to its Annual Report, EIT plans to invest €300 million in nine European countries in 2017, and expect a 50 percent increase in products and services delivered to the market and an intake of at least 60 new scaleups in the accelerator portfolio. EIT also plans an intake of at least 400 new master students and 40 new doctoral students, as well as several new online education initiatives. At the meeting, EIT Digital signed a collaboration agreement with the European Startup Network, and Karen Boers said that collecting reliable data on startups was one of the aspects she hoped the collaboration would lead to. “Together we can gather reliable data sets, on how fast startups are growing, how fast they are funded, how they grow outside their local market and more. It’s also important not to compare apples to pears—there’s for example no consensus on what a startup is,” Boers told me. She also said that it would be important to drive entrepreneurship from bottom-up, with citizen power. “If you leave this to the EU it will take ages”, she noted and expected the collaboration with EIT Digital to help provide access to a European network of industry, universities and research institutes in a credible way. “A third area for working together is a focus on going to market. The EU has a lot of money of different kinds and a lot of that money goes to basic research, but taking innovations to market is hardly funded because the money is not designed to do that. We sometimes advise startups not to take that funding since they will be stuck in research. The funding forces you to stay on that route or lose the money,” Boers added. In fact—the aim for EIT Digital from now on is to get startups in the organization’s program to market within one year. The goal is ambitious and laudable. If it helps addressing Europe’s weak position in bringing digital innovation to market at a massive scale remains to see. But clearly, without initiatives such as EIT Digital, Europe’s future would look darker. Disclaimer: EIT Digital covered my travel expenses for visiting the Annual Meeting. Note: If you’re interested in this topic, I also do talks and seminars on technology, future, and digitalisation.